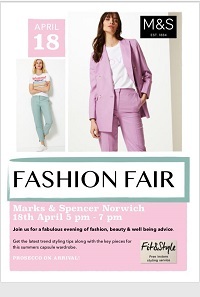 Join me and the Norwich Marks and Spencer team for an evening of fashion and wellness perfectly styled together! A brand new initiative, the evening will supply you with on-trend wardrobe tips as well as health and wellness tips to get you looking AND feeling Fabulous! Enjoy drinks and nibbles and a fun evening focussed on bringing out the best of your wardrobe as well as You! 18th May 2019 brings together local business women from Norwich and surrounding areas fora night of fashion, motivation, laughter, beauty & more The evening will include: Psychic readings, A fashion show, skincare, Nutrition and health talks to be the best you, business support and Mini beauty treatments. 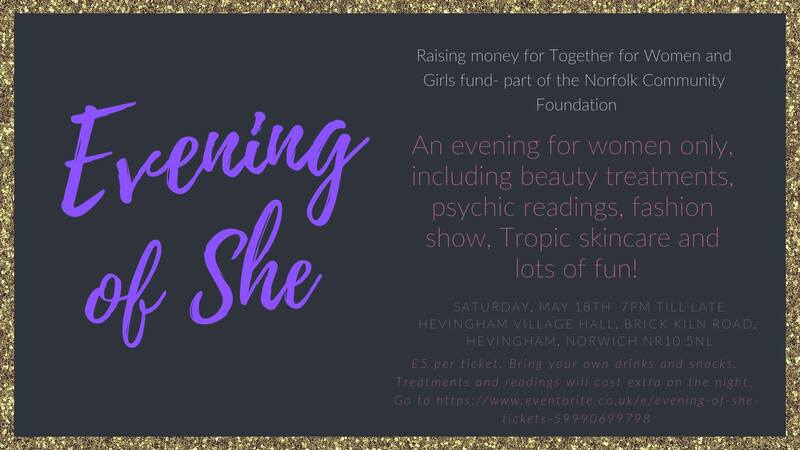 Money raised will go to Together for Women and Girls, which is part of the Norfolk Community Foundation that supports the empowerment and opportunity of women and girls to challenge inequality, abuse and disadvantage.